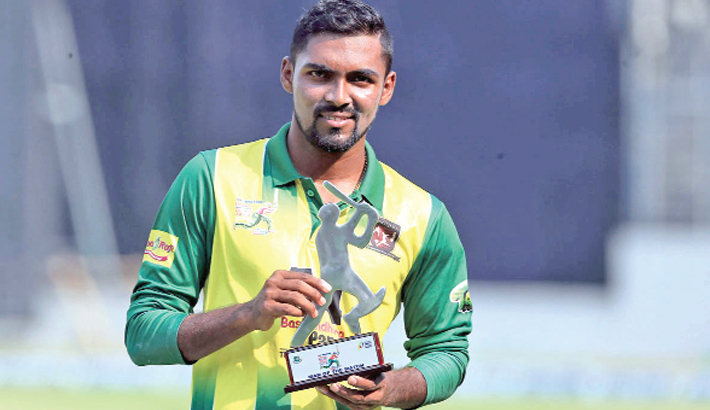 Sheikh Jamal DC bowler Nazmul Islam Apu poses with his man of the match trophy on Thursday. Lt Sheikh Jamal Dhanmondi Club Ltd ended their journey of Dhaka Premier Division Cricket League 2017-18 season as the runners-up as they played their last match at Sher-e-Bangla National Cricket Stadium on Thursday. Sheikh Jamal played 16 matches this season in which they won in 10 occasions and lost the other six matches. They have 20 points under their tally—four points short from champions Abahani. Meanwhile, Legends of Rupganj also have equal number of wins and equal points as Sheikh Jamal but Jamal had the upper hand in the scenario which awarded them the runners-up prize. On head to head encounters with Rupganj, Sheikh Jamal triumphed by 3 runs in their first meeting in DPL group stage on February 7. In their second face off in the super league, Jamal outplayed Rupganj by 7 wickets. Winning in both meetings added an edge over Rupganj thus Jamal finished their campaign as runners-up. Team Jamal played brilliant cricket throughout the series and they could have completed the season as the champions but Abahani had the last laugh with two more wins than Jamal. Jamal and Khelaghar Samaj Kallyan Samity take on each other yesterday in their last clash of the super league where Khelaghar won by 4 wickets. Winning the toss, Khelghar sent Jamal to bat first. Their strategy paid off as Jamal batsmen lost momentum early in the innings but their skipper Nurul Hasan Sohan came in to rescue in the middle order. Sohan played a vital knock of 47 runs off 55 balls which is also the highest score of their side. Regulated bowling by Khelaghar helped them to end Jamal’s innings for 160 runs in 45 overs. Sheikh Jamal bowlers hit Khelghar batsmen at the beginning of their chase as they lost 4 wickets for 32 runs. But their captain Nazimuddin (61) and Rafsan Al Mahmud (46) helped them to chase down the target with four wickets in hand. Jamal spinner Nazmul Islam Apu claimed a five-wicket haul conceding 32 runs. Despite losing the game, he was adjudged the man of the match for his brilliant performance with bowl.